The vast majority of websites in the world never get updated. A tiny proportion get new material every now and then, a really tiny proportion get extra content each week. An even tinier proportion of websites get daily updates. Where is your website on this spectrum? The chances are your website is “average” in terms of its updating – which currently hovers around the once every ten days mark for a typical business website. Website owners complain it is lack of time that is the real issue. “How can we update our website when we have all this work to do?” they ask. Frankly, though, if they wanted to, they could find both the time and the money to update their websites more frequently. The real issue is a psychological phenomenon of “anticipated regret”. This is an almost instinctive part of our behaviour that prevents us from doing lots of things. We remain with the status quo because if we take some action we believe there might be a problem or difficulty that arises from that action. So we don’t do it. Much potential content is denied from the web because website owners subconsciously perceive some kind of potential problem if they were to add a blog post. They are unconsciously worried that they will regret adding the content, perhaps due to negative comments, or even no comments. Businesses appear to have collected “anticipated regret”, with everyone subconsciously aware of the potential difficulties that regular blogging might cause. So, guess what, it doesn’t happen. We often do not act because we subconsciously fear at some stage in the future we will regret taking that action. It is all part of our in-built survival instincts. Anticipated regret appears to have a greater impact when we have longer to ruminate on things. If we have time to ponder on our actions, we can find all sorts of consciously thought-out reasons not to act. “I can’t blog today because I have to prepare for an important meeting this afternoon. ” Or “We can’t possibly blog every week because we mustn’t put our staff under such pressure, it would be unfair on them and become a health issue due to stress.” You get the picture. It is all about putting things off because we might actually in the future regret doing them now. New research, however, points to another psychological factor which could be used to counteract anticipated regret. In a study of a simulated air crash, researchers investigated the decision-making taken by emergency services. There were 194 people involved in the pretend incident and they worked under the same intense time-pressure which would occur in a real incident. Such training practices take place regularly, of course. One of the issues in such situations is that the decisions taken by emergency services personnel are literally life and death. You would think that under the pressure of time, their decision making could be impaired and that mistakes could happen. However, what the research found was that when under extreme time pressure our decision-making improves. We get better at making decisions when we have a really tight deadline, it seems. This is partly because we start to rely on intuition – essentially we hand over decision-making to our subconscious brain. When we have the time to make decisions consciously we tend not to be so good at it. Talk to journalists and many of them will tell you that their best stories are usually those which are under pressure, battling away against a seemingly impossible deadline to get something onto the front page or into a specific broadcast bulletin. Sure, journalists are unlikely to have to make life or death decisions like the emergency services, but the principle is the same. The deadline enables their brain to work better. 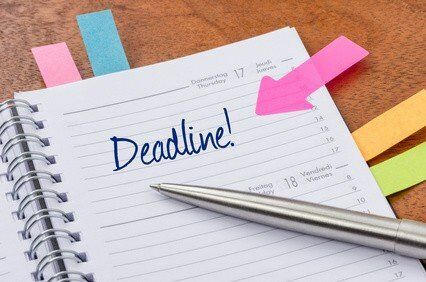 Of course if you say deadlines do not work for you, that you don’t respond well to them, all that is really happening is that you are consciously adding to “anticipated regret”. Research shows deadlines do help. So, how can you use these two competing psychological factors in your business? The answer is to impose deadlines for content production. No more “can you produce a blog post sometime this week”, but instead, “I need your blog post by 2.35pm today”. Deadlines work – even artificial ones, even ones you set for yourself. They make people think more clearly and they help reduce anticipated regret. The result is you will get more content on your website – precisely what you need. If you want to be sure your website is regularly updated with content, start setting deadlines. And if you want to make sure you do set deadlines – do it now. Hey, I give you exactly 14 minutes from NOW to set your deadlines for the month ahead. That’s it, you have a 14 minute deadline to meet. Get on with it! If you meet that deadline, you’ll have set your blogging deadlines for the next four weeks. Of course, if you allow the anticipated regret of starting work now to take over, you won’t set any deadlines. So, get on with it, you only have 13 minutes now…. !